Lately I’m on a work-clothes buying craze, which in some ways is pointless when you’re dealing with sick people because there’s always something that’s going to get spilt on you. Like projectile vomit on my favourite pink cardigan. Blood on my shoes. Abdominal proteinaceous fluid on pants in spite of wearing a gown. I could go on, but for your sake I wont. In spite of this, I continue to buy myself nice stuff because a lot of the time, my job isn’t nice. You’ve got to find ways to take the edge off. I’m having a huge thing for Pour La Victoire at the moment, the sizing is small but they’re so well made. These look fabulous with everything. I’m a huge menswear fan, with flashes of girliness from time to time but at work it’s all business. I admit, I bought it entirely for the sleeves. I love them! Anyone know where to find some ultra low-slung workpants I can tuck this into? And I don’t mind a little bit of lace either – but just a little. I think this one’s going to be a staple. I have no idea who Club Monaco are but they make some nice stuff. And I probably shouldn’t be buying silk in my job, but you only live once. 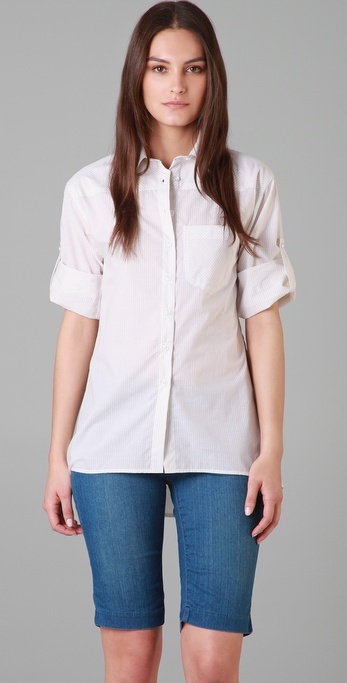 And what do you do when you think the Equipment Signature Blouse is just way too much money? You buy a Madewell one instead. That should keep me out of trouble at work for a while! Pretty clothes! I went a bit nuts on ASOS (I needed enough clothes to rotate through). It’ll be a wonderful day when I can afford more than polyester and Target. I’ve only been bled on once but luckily I was in scrubs. Unfortunately I’m not too good with faecal matter or vomit still – this gag reflex disappears, yes?